Silicon Valley-based mobile software company BlueStacks has been getting quite some attention (including from us) for its yet-to-be launched GamePop console + monthly subscription that will supposedly enable people to play a host of popular Android and iOS games on their TVs. 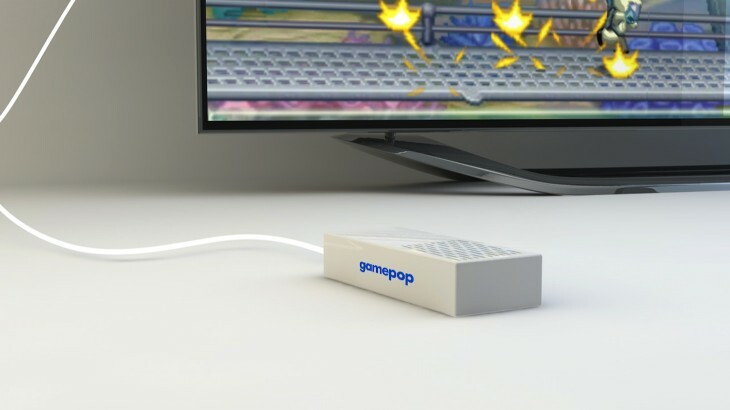 Today, the company is presenting a new offering, dubbed the GamePop Mini, which will essentially be a smaller, nimbler version of the console that will be gratis (compared to $129 for the regular GamePop console). GamePop Mini is thus essentially free hardware, but it will come with a subscription for games priced $6.99 per month. It’s impossible to report this news without pointing out that the Wall Street Journal yesterday revealed that Google is working on an Android gaming console of its own. If that report checks out and said console makes it to market, it will remain to be seen whether fledgling rivals like BlueStacks or OUYA stand a chance. What do you think? Like its big brother, the new, leaner GamePop device (see render in featured image above) will run Jelly Bean 4.2, connect to a TV via a supplied HDMI cable and include a curated group of 500 mobile game partners, including HalfBrick (Fruit Ninja, Jetpack Joyride), Glu (Blood Brothers) and kids app developer Intellijoy. As for the differences: we understand that GamePop proper will have a “nicer form factor, fit and finish”, boast a faster chipset, more peripherals and be “more expandable”. If that will be enough to warrant a $129 price difference remains to be seen. The GamePop Mini can be ‘purchased’ from Monday via the product website. The regular GamePop can also be ordered for free (as a launch promotion) through Sunday night. We have always planned on having a free console option. The biggest value of the GamePop service is its content – not the box. Hardware costs have come down so fast that we’re able to undercut the rest of the market. With the free promotion we’ve been doing in June we’re already seeing a ton of adoption. That volume then attracts more developers and therefore more and better content. It’s building momentum. The company is not disclosing how many pre-orders of the GamePop console it has seen to date, only saying that “they are stronger than expected”. Both GamePop consoles are slated to ship this winter. Up until now, BlueStacks was best known for its App Player software, which now caters to 10 million users who want to play their favorite mobile games on a Mac or PC desktop computer. BlueStacks is backed by the likes of Andreessen Horowitz, Qualcomm Ventures, Citrix Systems and Intel Capital. BlueStacks also raised funding from Austin-based AMD, makers of the new chips for the Xbox One and PS4 consoles and one of its strategic partners.